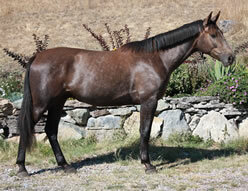 We are proud to present Linux, our gelding for Sale by Martini Pg*E* out of Liana. Linux is very strongly built with amazing bone and large joints. As a 2 year old he already stands at 16.3 hands and should mature well over 17 hands. He shows nice lift in his shoulder and great overall use of his body in all 3 gaits. He also has a very nice hip and a great neck set which should make him a great dressage horse or jumper. He was born a chestnut color but is turning grey just like his dam Liana, he also received her large kind eye. He is very friendly and loves attention. He is very easy to handle and has been that way since birth. We believe, this great temperament has been passed down by his famous sire Martini. Jean Brinkman, owner of Valhalla Farms in Florida, imported Martini in-utero from Germany. She raised him and took herself through Grand Prix with this great stallion. For several years, Martini was the leading dressage sire in USDF rankings in North America, he sired a number of highly successful performance horses that made it up to Grand Prix level. He is also the sire of several approved stallions, of which Stiletto *Ps* is his most successful one. This beautiful grey stallion competed successfully at Intermediate level eventing, won in Intermediare I dressage and is continuing his dressage career up to Grand Prix. He has sired several good sport horses, among them Copycat Chloe, the individual Gold medal winner of the 2010 North American Young Rider Eventing Champinships in Kentucky. On the dam side, Liana carries highly proven Trakehner bloodlines. With Hansel, Topas II and especially Matador, his line is built on substantial stallions that had significant impact on the development of the modern Trakehner sport horse. Matador (by Donauwind *E*) was a major sire in Germany and apart from many good sons, sired the dams of such exceptional stallions as E.H. Monteverdi TSF, E.H. Michelangelo and E.H. Hohenstein. Liana is one of the last daughters from her sire Hansel as he is a deceased stallion. Martini is also deceased making Linux’s bloodlines very rare! Linux will make a super high end hunter/jumper, an awesome Dressage horse or Eventer, he has the makings for an all around horse in his bloodlines. He has a fabulous, uncomplicated temperament and is a super fast learner.